Barcelona’s Gothic Quarter, which lies at the heart of the city, is a maze of narrow cobblestone streets, medieval buildings, and remnants of the past. Here visitors will find several of Barcelona’s most esteemed museums and monuments, as well as a plethora of art galleries, artisan boutiques, shops, and restaurants. Most of the buildings date from the 14th and 15th centuries, when Barcelona was at the height of its commercial prosperity and before it had been absorbed into Castilla. A masterpiece of its medieval heritage, the Barri Gòtic's catedral, is one of Spain's greatest Gothic buildings. Once a separate village north of L’Eixample, and then in the 19th century an industrial district famous for its Republican and liberal ideas, Gràcia was incorporated into the city of Barcelona in 1897. In those days it had some catching up to do, as the town had poor roads, schools and clinics, and no street lighting or sewers. In the 1960s and '70s the area became fashionable among radical and bohemian types, and today it retains some of that flavour – plenty of hip local luminaries make sure they are regularly seen around the bars and cafés of Gràcia. La Pedrera was designed by Gaudí and built between 1905 and 1910 as an apartment/office block. Formerly called the Casa Milà, it's better known as La Pedrera (the quarry) because of its uneven grey stone facade that creates a wave effect, which is further emphasized by elaborate wrought-iron balconies. Casa Mila, also called “the Quary” because of its rock-like façade, was Gaudi’s last private commission. Although the apartment building still maintains some residences, most of the structure is open to visitors. There is a special exhibition housed in the attic of the Casa Mila, which includes models and explanations of all Gaudi’s projects. Especially interesting, is the wonderland of rooftop chimneys and staircases that visitors can traverse, while circling a large opening to the building’s central courtyard. Another one of Gaudi’s amazing creations, Casa Batllo was built for the private residence of a wealthy textile industrialist, Joseph Batllo. The house is a modern interpretation of Barcelona’s medieval roots, with a rainbow of dragon scale shingles on the roof, and skeleton-like railings for the balconies. The inside is open to visitors, and displays some of Gaudi’s furnishing creations as well. This colourful strip of Barcelona culture, whose name comes from the Arabic word for riverbed, was originally just a path beside a stream running through the centre of the old city. Today, however, this famous avenue is a bustling centre of activity. From the early morning to the wee hours of the night, one can find nearly everything under the sun on the Ramblas. There are street performers by the dozens, baby ducks, snakes, and bunnies for sale, florists galore, as well as endless restaurants and snack shops for when you need a break from all the excitement. Las Ramblas runs from Placa de Catalunya, a main square full of shops, restaurants, and banks, located at the centre of the city, down to the monument of Columbus on the waterfront. The avenue is broken up into five distinct sections, each with its own name and characteristics. The most complete part of Barcelona's favourite son, Antoni Gaudi´s church, finished in 1904, has 3 doorways which represent Faith, Hope and Charity. Each doorway has four towers, symbolizing the 12 apostles. The Temple is still a work in progress. Despite being very much a building site, the cathedral has a certain beauty that counts as his greatest work. Gaudí died in 1926 before his masterwork was completed, and since then, controversy has continually dogged the building program. The mountain, which acts as a backdrop for much of the city, is home to exotic gardens, the Greek theatres, several of Barcelona’s museums and sculptures, as well as the Olympic stadium. At its summit sits the castle of Montjuich, an old watchtower from the late 17th and early 18th century. However, mount Montjuich’s most popular attraction is by far the Magic Fountains. This wonder of light, water, and music was constructed for the 1929 Universal Exposition. Today, the fountains’ shows awe hundreds of visitors each weekend, while providing a spectacular view of the National Palace in the background. The Picasso Museum reopened in 2000 with two new exhibition spaces that will host temporary exhibitions. The permanent collection is devoted to the artist's early work, including a large number of Rose and Blue period paintings, exhibition posters and childhood sketches. The delightful collection is housed in two fifteenth-century palaces close to the Parc de la Ciutadella. The Palau Nacional on Montjuïc was the focus of Barcelona's International Fair in 1929 and now houses the National Museum of Catalonian Art. The museum boasts a stunning collection of Gothic, Romanesque and Medieval treasures and religious artefacts. The most impressive approach to the Palace is up Avinguda de La Reina Maria Cristina from Plaça Espanya; the Avinguda is lined with fountains that are floodlit at night. Montserrat, 50km (31mi) northwest of Barcelona, has weird rocky crags, ruined hermitage caves, a monastery and hordes of tourists taking a break from their holidays on the Costa Brava. The Monestir de Montserrat was founded in 1025 to commemorate visions of the Virgin Mary. Today it houses a community of about 80 monks, and pilgrims come to venerate La Moreneta (the Black Virgin), a 12th-century Romanesque wooden sculpture of Mary with the baby Jesus; La Moreneta has been Catalonia's official patron since 1881. The most dramatic approach to Montserrat is by cable car, which arrives just below the monastery after a thrilling whoop up the sheer mountainside. With Parc Güell, Gaudí created a fantasy land that seamlessly combines the natural and the man-made, as well as offering good views back over the city. The park, originally conceived as a garden city, covers a hill to the north of the centre. The gardens are enlivened by fantastic pavilions, stairways, columned halls and an organic plaza decorated with stunning broken-mosaic work (trencadís) by Gaudí's assistant, Josep Maria Jujol. At the base of the hill is a house designed by Francesc Berenguer that now houses a collection of Gaudí's furnishings and other memorabilia. Barcelona’s second landmark hill is Tibidabo, about four miles (six km) northwest of the city in a wooded range that forms a backdrop to the city. 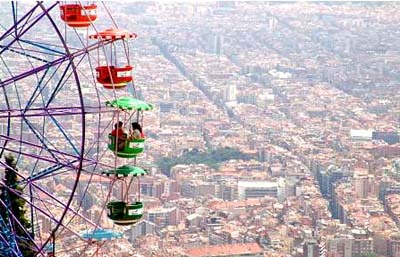 Tibidabo can be reached by funicular, and is particularly popular at weekends with locals because it is home to the Parc d’Atraccions, an amusement park with some thrill rides and renowned house of horrors. Tibidabo also features the soaring Torre de Collserola telecommunications tower which offers visitors the chance to ride in a glass lift to an observation platform 377 feet (115m) high to enjoy a spectacular view. There is also a large, interesting church called Temple del Sagrat Cor surmounted by a giant Christ statue which also offers a lift to a rooftop viewing platform.